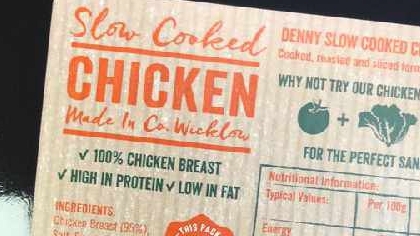 IFA Protest Over Labeling Of Chicken Slices As "Made In Wicklow"
A demonstration has taken place outside Kerry Foods' headquarters over what is being claimed is the company's exploitation of a loophole in food labelling laws. The protest comes after it was discovered Brazilian chicken was labelled as 'made in Wicklow'. According to the Food Safety Authority of Ireland (FSAI), this product falls under general labelling rules, and is not required to give the origin of the meat. The IFA say they want the law changed so consumers can tell the origin of the main ingredient.